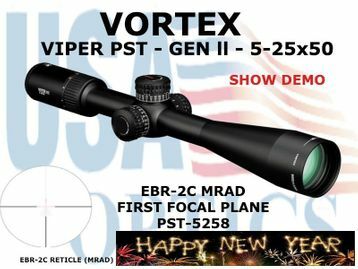 VIPER PST GEN II 5-25x50 RIFLESCOPE - show demo / never mounted ..
➢ XD Lens Elements - Extra-low dispersion (XD) glass increases resolution and color fidelity, resulting in crisp, sharp images. ➢ XR Fully Multi-Coated - Proprietary coatings increase light transmission with multiple anti-reflective coatings on all air-to-glass surfaces. ➢ First Focal Plane Reticle - Scale of reticle remains in proportion to the zoomed image. Constant subtensions allow accurate holdover and ranging at all magnifications. ➢ Glass-etched Reticle - Protected between two layers of glass for optimum durability and reliability. ➢ Illuminated Reticle - Provides precise aiming under low-light conditions. ➢ Tube Size - 30 mm diameter. ➢ Single-Piece Tube - Maximizes alignment for improved accuracy and optimum visual performance, as well as ensures strength and waterproofness. ➢ Aircraft-Grade Aluminum - Constructed from a solid block of aircraft-grade aluminum for strength and rigidity. ➢ Waterproof - O-ring seals prevent moisture, dust and debris from penetrating the riflescope for reliable performance in all environments. ➢ Fogproof - Argon gas purging prevents internal fogging over a wide range of temperatures. ➢ Shockproof - Rugged construction withstands recoil and impact. ➢ Hard Anodized Finish - Highly durable low-glare matte finish helps camouflage the shooter's position. ➢ ArmorTek - Ultra-hard, scratch-resistant coating protects exterior lenses from scratches, oil and dirt. ➢ Tactical-Style Turrets - Exposed turrets provide fast, accurate and easily read elevation and windage adjustments. ➢ RZR Zero Stop - Zero Stop mechanism prevents the turret from dialing below sight-in range. ➢ Precision-Force Spring System - Uses premium components in the erector-spring system to ensure maximum repeatability and ease of adjustment. ➢ Fast Focus Eyepiece - Allows quick and easy reticle focusing. ➢ Built-In Accuracy Features - Matching (MRAD or MOA) turrets and reticles facilitate fast and accurate shooting at extended ranges. The patented fiber optic Radius Bar visually assists tracking turret rotations. US Patent 7,937,879.